Buying properties in Mauritius - a great idea! Mauritius - a beautiful resort area in the warm Indian Ocean. Mauritius is known for the magnificent beauty of unspoiled nature with numerous reserves, waterfalls and lakes, where tourists enjoy the white sand beaches and all kinds of water sports on the background of a well-developed infrastructure, superb services and an excellent cuisine. Buying properties in Mauritius - a great option in a great location! Housing in the country is diverse and with a high quality, but the most popular in Mauritius - are, of course, detached houses and villas. Buying real estate is widespread in big cities or in quiet areas. 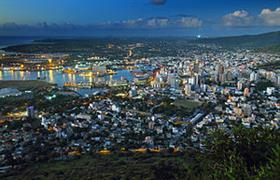 Among the largest cities of the island stands out the capital - Port Louis and the city of Rose Hill, where also dominate houses and villas rather than flats. Of course, you can find an apartment in a small residential complex, if desired, but they are very few. It is difficult to classify housing in Mauritius in the category of cheap, especially luxury properties from the owner on the coast, but the purchase of real estate on the island - one of the most profitable investments available today. Prices are largely depending on the location and quality of the object – all, located at some distance from the coast, will cost much cheaper. Being the owner of your own property on the island, you can fully enjoy all its benefits. Measured and peaceful life against the backdrop of a unique natural diversity is expensive! The prestige of the region provides some exclusivity to local residing foreigners living in its territory. For many - this is a big plus, as the island is not among the places for a mass tourism. Residential real estate in the country will always be relevant both to rent, and to resell. Since 2005, foreigners are allowed to buy a property in Mauritius. And if you buy luxury housing, then you can easily get a residence permit. The government welcomes the inflow of foreign investments in real estate and is doing amendments in the law relating to buyers from other countries. Look closely at this fantastic island, and perhaps, your second home is waiting for you there!